The most hostile administration to veterans in American history strikes again. The carefully-chosen mementos that cover graves in Section 60 of Arlington National Cemetery offer a deeply personal glimpse into the lives of grieving military families. These reminders have now been scrubbed away following a new policy which has banned family and friends from placing tributes on the graves. 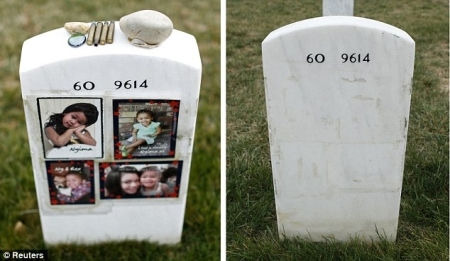 Headstones have been stripped of photos, drawings and poignant notes, in particular those in Section 60, home to the graves of more than 800 service members killed while doing their duty in Iraq and Afghanistan. An Arlington spokesman said they were responding to complaints that the cemetery was looking too disorderly, and said the section needed to follow the same rules as the rest of the site. Loved ones often left flowers, small stones and shells from favorite places and prized cigars. These have all now been swept away – some items saved to be returned to families, and some not. Photographer Kevin Lamarque published images of the graves earlier this year on PhotoBlog. In an article for Reuters, he commented this week: ‘There were immensely sad graveside moments of girlfriends, wives, children, mothers and fathers sitting, kneeling, laying beside a grave, often touching, holding or kissing the headstone of their fallen loved one. It would be easy to write this off as just an administrative change, but it’s coming at a time when the Obama administration is doing everything it can to hurt veterans, kids with cancer, older Americans, and even tourists who want to see state parks. This is an administration that’s hiring people to shut down parks and memorials that normally require no staff and suddenly, it starts doing something painful to the families of vets? Maybe, it’s a coincidence, but maybe it’s just one more shiv that the Obama administration is trying to stick into the backs of the American people.